The small city of Mountlake Terrace has about 4 square miles of land just inland of the Puget Sound in Snohomish County, Washington. The population here is 20,500. One corner of the city is taken up by Lake Ballinger which allows residents easy access to fishing and relaxing on the small beach. Despite the small land area, there are 9 city parks and recreation areas in town. This urbanized suburb is located between the cities of Shoreline and Lynnwood, about 15 miles north of Seattle. 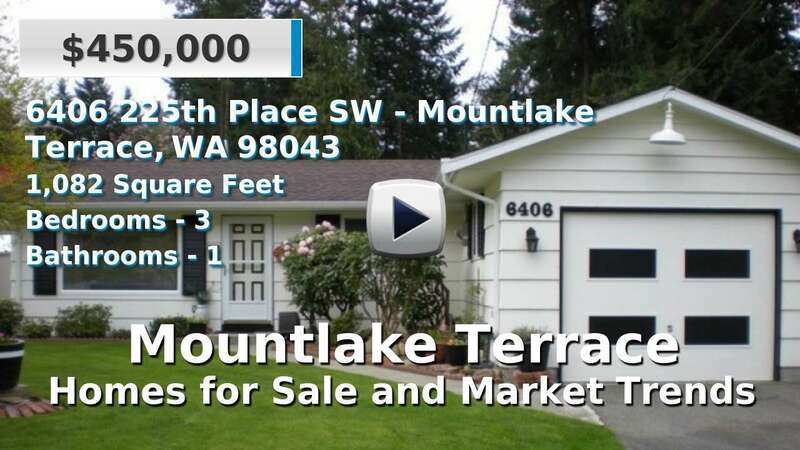 In general, homes and condos for sale in Mountlake Terrace are older than the average property in Washington, but the city is growing. 3 Beds | 1.75 Baths | 1151 sq. Ft.
3 Beds | 2 Baths | 1501 sq. Ft.
2 Beds | 1 Baths | 966 sq. Ft.
1 Beds | 1 Baths | 928 sq. Ft.
5 Beds | 3 Baths | 2652 sq. Ft.
4 Beds | 1.75 Baths | 1835 sq. Ft.